Denmark with its capital Copenhagen is located in Europe (Northern Europe, bordering the Baltic Sea and the North Sea). It covers some 43,095 square kilometers (slightly less than twice the size of Massachusetts) with a population of 5,605,950. Danish, English, Faroese and German are some of the languages spoken by the majority in Denmark (consider regional differences). Did you know that Germany is the only bordering country. Denmark is a country in Scandinavia. The main part of it is Jutland, a peninsula north of Germany. Sports are popular in Denmark, with football reigning supreme in popularity and counted as the national sport, followed by Gymnastics, Handball and Golf. Long distance train travel is best done with DSB, the Danish State Rail system. A number of long distance bus companies also operate. However, driving in Denmark between cities is very easy, with well-maintained roads everywhere. With a 7400 kilometre coastline, almost the same as Brazil's and longer than India's, you are never far from a beach in Denmark. Much has happened since the Danes were wrecking havoc to much of Northern Europe, but the more peaceful modern version of the Danes still take immense pride in their Viking heritage. Denmark is a very safe country, with almost no risk of natural disasters or animal attacks. Compared to most other countries crime and traffic are only minor risks, and most crime visitors are likely to encounter is non violent pickpocketing. As of 15 August 2007 it is not legal to smoke in any public space in Denmark. Denmark is teeming with amusement parks, and indeed features some of the most famous in world. The terrain is low and flat to gently rolling plains. The average density of population is about 130 per km². The climate in Denmark can be described as temperatehumid and overcast, mild, windy winters and cool summers. Possible natural disasters include flooding is a threat in some areas of the country (e.g., parts of Jutland, along the southern coast of the island of Lolland) that are protected from the sea by a system of dikes. To reach someone Denmark dial +45 prior to a number. The local cellular networks are operated on 900 MHz, 1800 MHz, 3G, 4G. Websites typically end with the top level domain ".dk". If you want to bring electric appliances (e.g. battery chaarger), keep in min the local 230 V - 50 Hz (plugs: C, E, F, K). The sign for the locally used currency Krone is DKK. 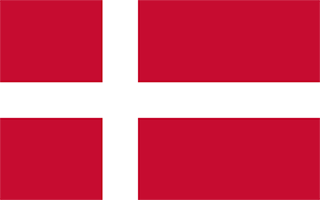 Red with a white cross that extends to the edges of the flag; the vertical part of the cross is shifted to the hoist side; the banner is referred to as the Dannebrog (Danish flag) and is one of the oldest national flags in the world; traditions as to the origin of the flag design vary, but the best known is a legend that the banner fell from the sky during an early-13th century battle; caught up by the Danish king before it ever touched the earth, this heavenly talisman inspired the royal army to victory; in actuality, the flag may derive from a crusade banner or ensign.